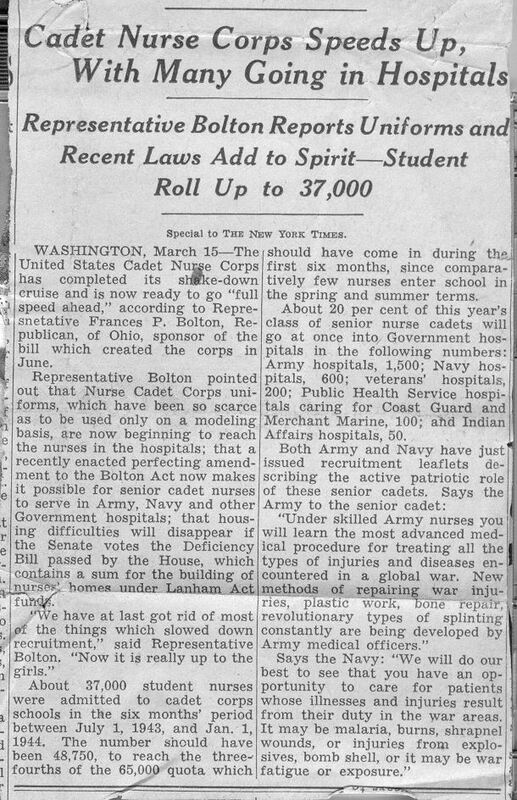 I have a clipping of me and 3 other cadets that appeared in the New York Times on March 16, 1944, and a clipping of cadet nurses, including me, with Surgeon General Parran and Lucille Petry from the April 12, 1944, Washington Post. I was fortunate to train in DC where I also had the privilege to meet and shake the hand of First Lady, Eleanor Roosevelt. After graduation, I worked at the VA Hospital in Fort Howard, Maryland. I met my husband there. We married and settled in Baltimore where we raised 8 children.